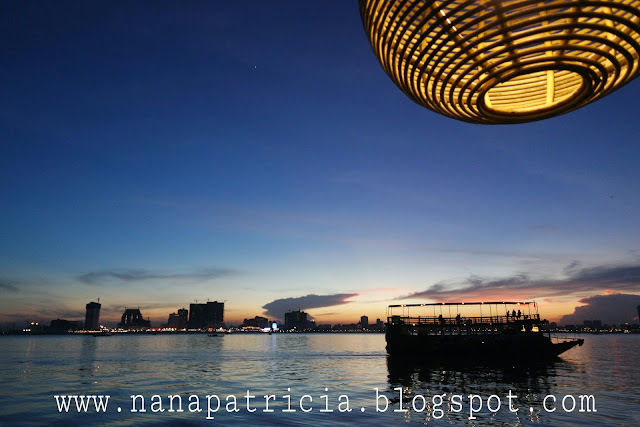 Nana Patricia | ♥Where ideas come to life♥: 5 Things to do in Phnom Penh! 5 Things to do in Phnom Penh! 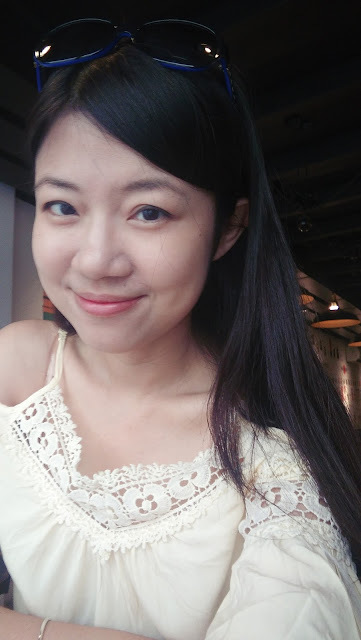 i'm back from my Phnom Penh weekend getaway! I didn't expect to have so much things to do in Phnom Penh! well, i gave it a missed to Prison S-21 (which is in the city) , Killing Fields (which is 15km from the city) , Oudong Hill (which is 40km from the city)..
if you are someone like me, you can go to the National Museum still, for the architecture! National Museum Phnom Penh do has a beautiful courtyard! Personally if time permitted , i will make a trip down to Oudong Hill for the spectacular Phnom Penh city view! If you are daring enough, why not?! Okay , let's have something fun in Phnom Penh! my top 5 things to do in Phnom Penh! This Palace was built in 1860s. The architecture is fascinating! No photo is allow inside the palace. It's a place with combination of Gold and Silver! I was fascinated by the Royal Gifts / Tribute during the olden days, those gold-tree & silver-tree which was once appeared in my world history textbook are now real at front of my eyes! They are real! Wow! Sisowath Quay , Phnom Penh situated strategically at the junction along Mekong and Tonle Sap River! Well , colour of the river is a little bit brownish. Cambodia Memorable Cruise operated by a group of Cambodian students. 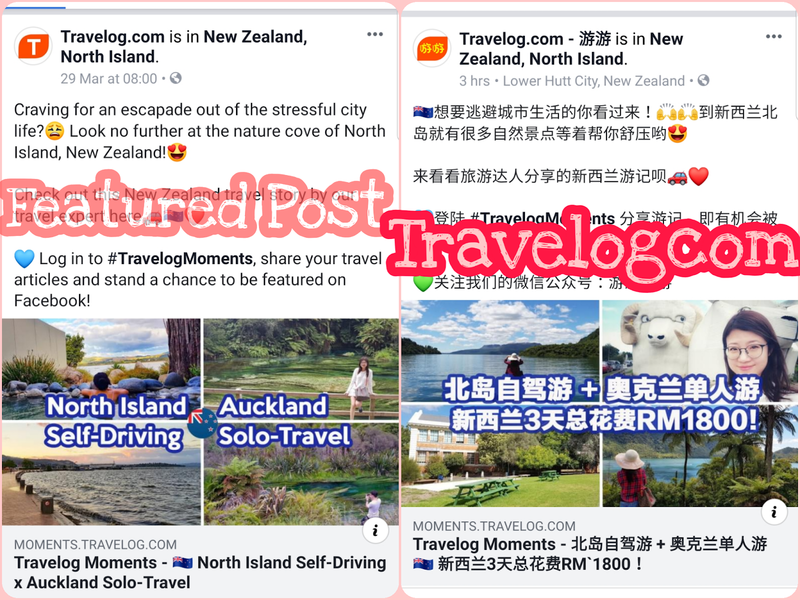 They have Sunrise Cruise, Sunset Cruise, Silk Farm Tour, BBQ night tour etc for tourist to choose from. We choose the sunset cruise.. We enjoyed our sunset cruise very much! Everything has captured in the memories! No wonder it named as Memorable Cruise! The crew will make sure you have a wonderful and memorable cruise ride! It's shopping time! 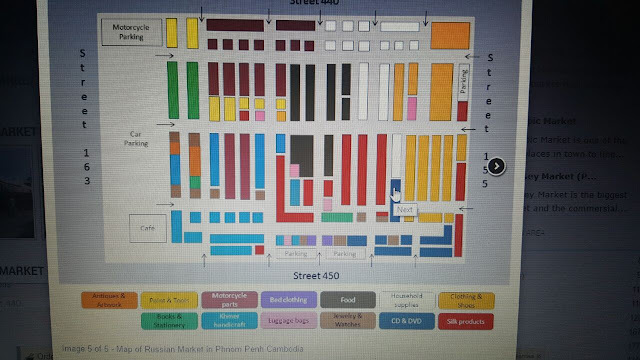 Personally i prefer Russian Market than Central Market! Russian Market is famous with it's factory outlet, the quality of cloths are really good, for a polo shirt, you can get it within USD4-6 , please dont buy if anything above USD6 . Bargain!! The design and quality of female dresses in Russian Market is better than Central Market too , range USD 10-15, however, you can try bargain at USD 8-10 first if you really heart for the dress! I got myself one good quality Nike sports wear at USD 5 from this shop here! Visit her , she can speak Mandarin! tailor made is available at here! There are a lot of local designer shoplot at the surrounding of Russian Market, good in quality! Do drop by and dig-dig-dig for best buy! Below is the map of Russian Market! Central Market is more organized if compare to Russian Market! The quality of clothing in Central Market are not good as Russian Market since Russian Market famous for it's Factory Outlet. Therefore , the price range is relatively cheaper in Central Market, around USD 3-4 for a 100% cotton round neck Tshirt? Again , the power of bargain! 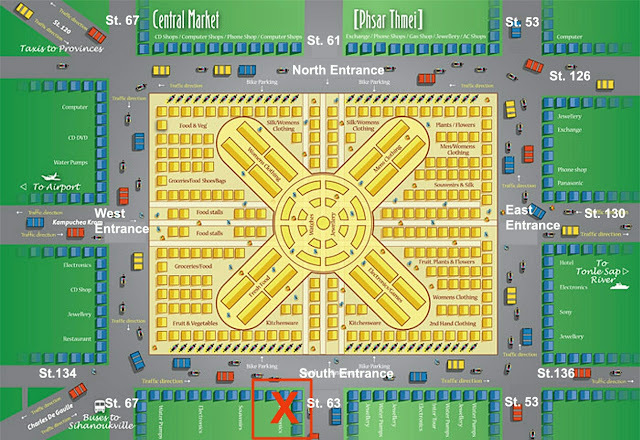 There are few section in Central Market, you may refer to the map below. Sorya Mall is very near to Central Market (you will just need to cross the street), do remember to drop by this mall if you have extra time. Vice versa, if you don't, you can just give it a skip! Hee hee. This mall is more like a digital mall which sell IT stuff or electronics gadget. How can you leaving a country without sending a postcard back to your home? Haha! Cambodia Post maintained at it's French Colonial style of architecture, very mesmerizing! It cost me 2,000 riel to post a post card home! The postcard was given by a China Chinese Couple whom we met in the post office! They are so kind to give us the post card for free! Thank you, though I didn't get your name!